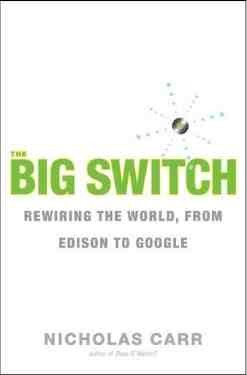 A Review of Nicholas Carr’s book “The Big Switch”, available on Amazon here. Do you work in devops or as a performance consultant? Do you manage web applications backed by databases? If so you probably love high performance beefy iron, big servers with equally fast RAID arrays that deliver lightening fast response to an entire application and ultimately your customers. A related article, Devops can learn from Sandy, serious and very real disaster recovery lessons. So if you’re like me you may feel a little leery about the cloud. On AWS for example, server commoditization has taken infrastructure for a sharp turn south. We struggle with unreliable disk performance & shared network bandwidth, while our applications compete with other customers in the so-called multi-tenant environment. Even the servers themselves drop like flies. Something’s got to give! All of them would be wise to study the examples of General Electric and Westinghouse. A hundred years ago, both these companies were making a lot of money selling electricity-production components and systems to individual companies. That business disappeared as big utilities took over electricity supply. But GE and Westinghouse were able to reinvent themselves. They became leading suppliers of generators and other equipment to the new utilities, and they also operated or invested in utilities themselves. Most important of all, they built vast new businesses supplying electric appliances to consumers — businesses that only became possible after the arrival of large-scale electric utilities. Sometimes a company can discover an even better business if it’s willing to abandon an old one. Shopping for a smartphone? Find out why the Android platform is broken. That’s why Carr’s book offers an eerie and uncanny read. What we’re seeing today in infrastructure very closely parallels what happened to electricity before it. Turns out at the turn of the century electricity production was not centralized and no electric grid was yet criss-crossing the country. Big companies actually built and managed their own power plants. Through the efforts of great entrepreneurs like Thomas Edison & Samuel Insull, the electricity production machinery were centralized and eventually incorporated and run by government managed utilities. All of this drove costs of electricity precipitously downward. Looking for a database expert? Take a look at our MySQL Interview guide for candidates, hiring managers and recruiters alike. How did we benefit? Oh can you count the ways? Now households could afford electricity too. Next we saw consumer appliances and automation begin. Vacuum cleaners to washing machines flourished, bringing social change with it. What the fiber-optic internet does for computing is exactly what the alternating-current network did for electricity: it makes the location of the equipment unimportant to the user. But it does more than that. Because the internet has been designed to accomodate any type of computer and any form of digital information, it also plays the role of Insull’s rotary converter: it allows disparate and formerly incompatible machines to operate together as a single system. It creates harmony out of cacophony. Cloud providers fail, components fail, datacenters fail. Find out why AirBNB & Reddit didn’t have to fail even while it’s AWS cloud went down. The shift to cloud computing is way bigger than one application or one business. And the gains and momentum are way larger than we in devops may realize. With that it’s an inexorable shift, and one we would do well to embrace. Like all shifts we need to learn to adopt our technologies, as the benefits to business are incalculable.